WAFFLES: Um hi everybuddy. Waffles Too here. I'm here with my new friend, the Mail Chimp. He came over to play Monkey See, and also to tell you about something new. MAIL CHIMP: Hi everyone. Thanks for inviting me over, Waffles. WAFFLES: Thanks for the cool hat, Mister Mail Chimp. 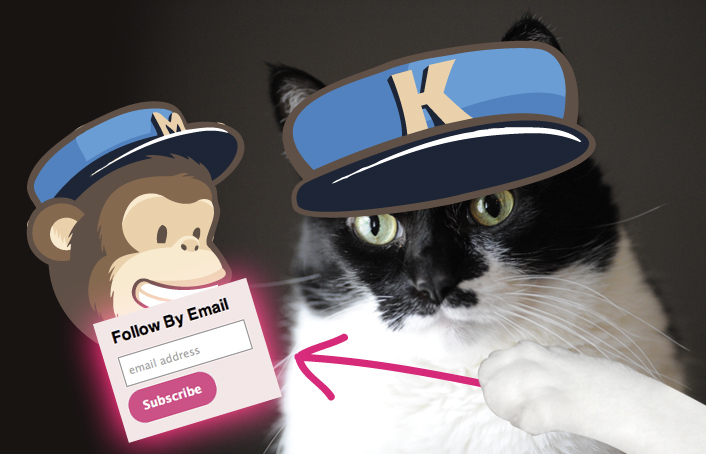 MAIL CHIMP: I suppose you're wondering why a monkey would want to hang out on a cat blog, huh? WAFFLES: Well, don't tell...but Glogirly's nickname for me IS Monkey. MAIL CHIMP: I'll take that as a compliment, Waffles. 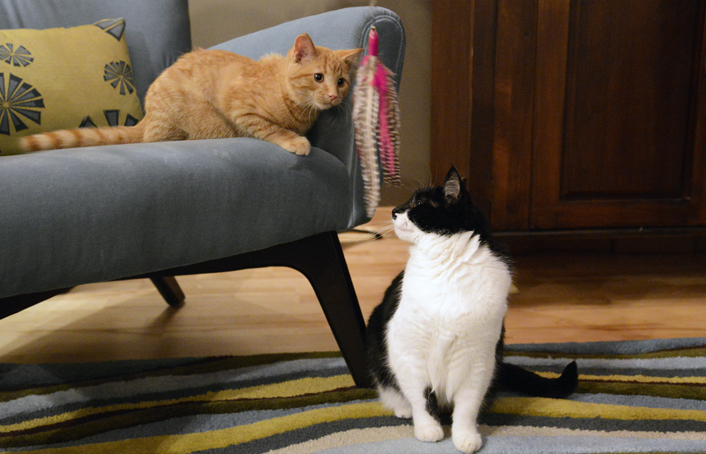 WAFFLES: Um, so WHY are you here again? MAIL CHIMP: I'm here to tell everyone that GLOGIRLY.com has just launched a brand new follow-by-email subscription program with Mail Chimp. In fact, if you were already a subscriber through Feedburner, your email address has been transferred over to our new feeding system and you should already be receiving your daily GLOGIRLY updates. WAFFLES: Um, feeding system??? You mean like bananas? MAIL CHIMP: No silly, it's a BLOG feeding system... so none of your friends ever miss your blog posts and go hungry for GLOGIRLY. All your readers have to do to subscribe is enter their email in the new box at the top of the sidebar. It will take them to a cute pink page where they select html or text only for their emails. Then they'll get an email back from you to confirm their subscription. Done! WAFFLES: I was kind of hoping for bananas. MAIL CHIMP: The emails your friends will receive with your new blog updates are super easy to read and look really cool. They'll see your logo and lots of pink. ← ← ← Just like this sample to the left. WAFFLES: That's cool. But I was kind of hoping for orange. MAIL CHIMP: There's also social media share buttons at the bottom. Your friends can just click to share your post on Facebook or Twitter. They can even email it to their boss. As long as their boss likes cats. WAFFLES: I sure hope SOMEBODY'S Boss likes cats. MAIL CHIMP: And there are some fancy square follow buttons just in case one of your friends doesn't already like you on Facebook, follow you on Twitter, pin with you on Pinterest or watch you on YouTube. You are after all, multi-channel cats! 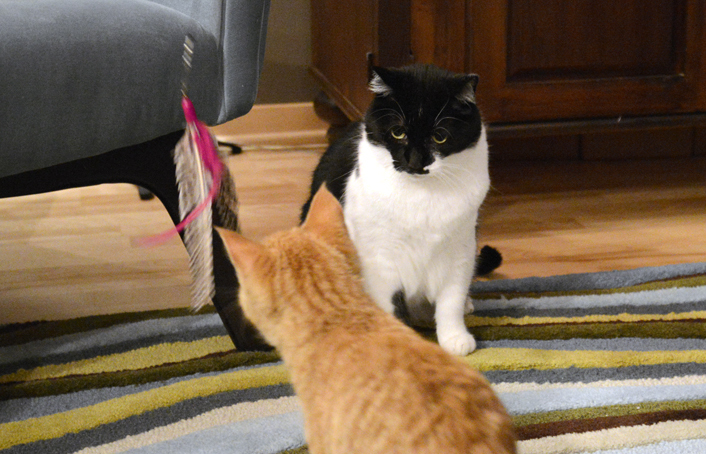 KATIE: So Waffles, how about letting ME get a word in edgewise? WAFFLES: Um, just one word? 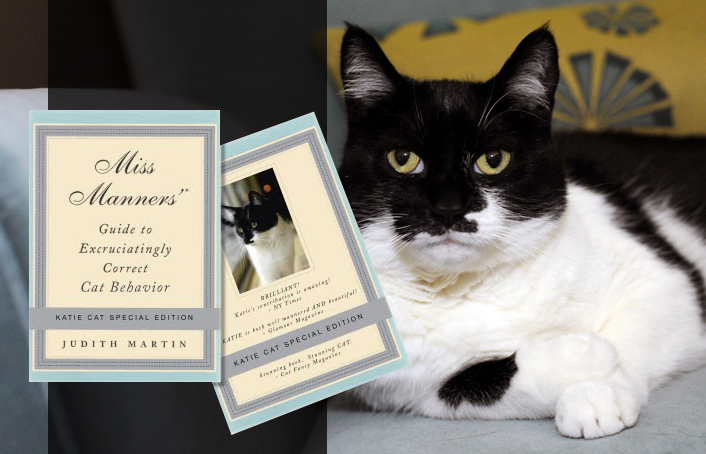 KATIE: If you would enjoy having me and Waffles land in you inbox everyday, please make sure to type your address in the little box at the top of the sidebar and click SUBSCRIBE. If you thought you were subscribed but haven't received anything from us in the past couple of days, please check your spam filter. And if all else fails, you can easily sign up again. I promise it will be fun and I promise you'll be safe from spam. Unless you really want to eat ham in a can. WAFFLES: Um, Boss? But what if someone doesn't want us showing up in their email? How can they follow us? KATIE: Excellent question (...can't believe I just said that.) Lots of our friends have been following us through Google Reader which is going away on July 1. In fact some people are reporting it's already gone. We've got an awesome alternative to that called Bloglovin'. Many people are already using it and Bloglovin' it. It's really easy to set up an account and you can follow all the blogs you want from any platform. 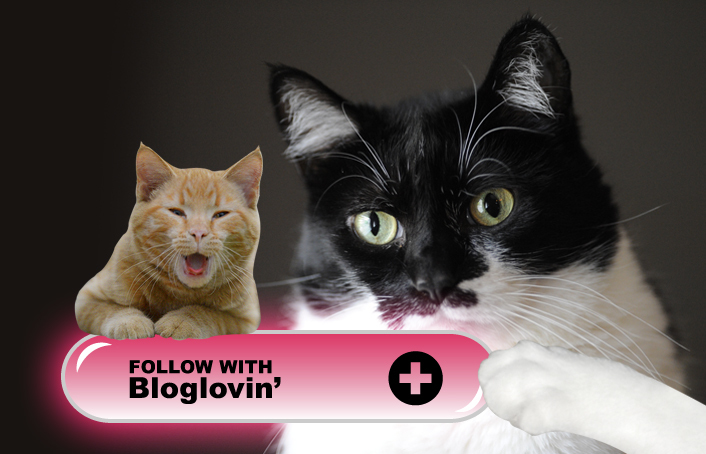 (Blogger, Wordpress, etc...) To make it even easier, we have a new Bloglovin' Follow Button at the top of our sidebar. Just click it to follow GLOGIRLY. We'd love to hear from you if you experience any trouble with our new Mail Chimp emails or Bloglovin'. You can just hit 'reply' to our emails, they'll come straight to us. Or send us a separate email at glogirl@visi.com. 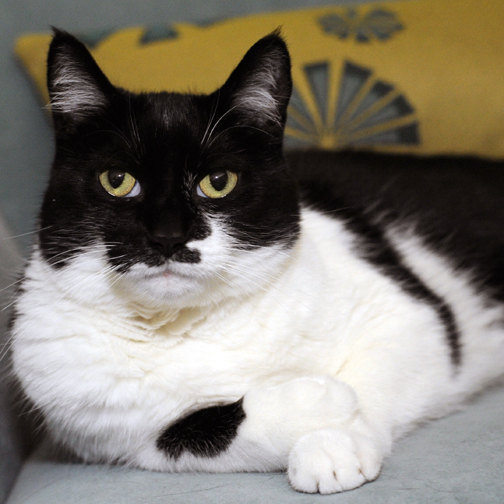 WAFFLES: So Boss? 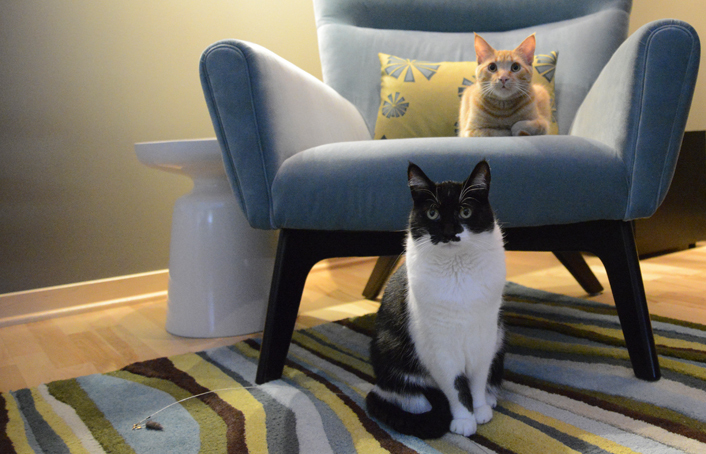 Do I have to use Bloglovin' to follow you around the Townhouse? 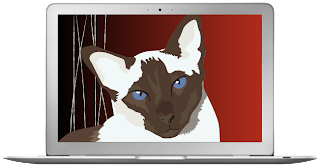 We'd like send a BIG thank you to The Cat Post Intelligencer's Chey & her Human for helping us out with the technical side of Mail Chimp. Sometimes the techie-stuff makes our heads spin here and it's really nice to have a great guru to fall back on. She's just an email away if you need some help of your own! Q: Is Feedburner going away? A: According to Google, No. Only Google Reader is going away. You'll still be able to receive email updates to other blogs you've subscribed to. But OUR subscribers are now receiving blog updates from Mail Chimp. Q: Do our subscribers receive a new email each time we publish a new post? A: Yes. We typically post once a day, so subscribers will receive 1 email from us per day at approximately 1:00 am CST. Q: Does the new Mail Chimp email have a summary of blog posts? A: No. It includes the most recent post in it's entirety. But there are links at the bottom to other recent posts in case you missed any that you want to catch up on. Q: Do we share emails? Q: Are there other readers out there besides Bloglovin'? A: Yes! Many people are liking Feedly. Q: Is Waffles still annoying you? Hi everybuddy. Waffles Too here. 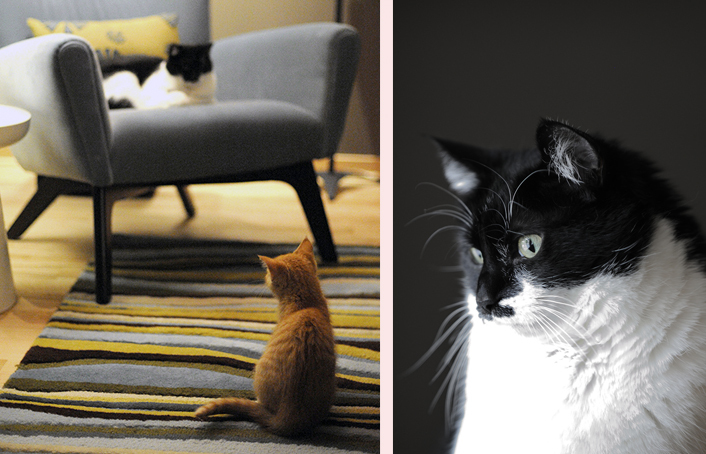 The Boss doesn't really like today's photohunt theme (*citrus*) so she tole me I could do the blog post. 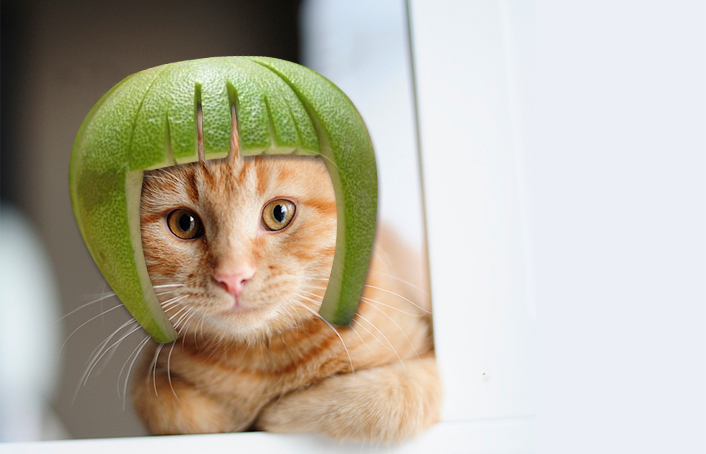 I guess lots of cats don't like the smell of oranges and limes and stuff. And I don't think the Boss likes helmets much either. But she says I'll stick MY head anywhere. I figure this will buy me a little more time in her blue chair. KATIE: Don't count on it, Waffles. Hey everyone... if you subscribe to our blog via email, you may have noticed our blog post updates are looking a little different. 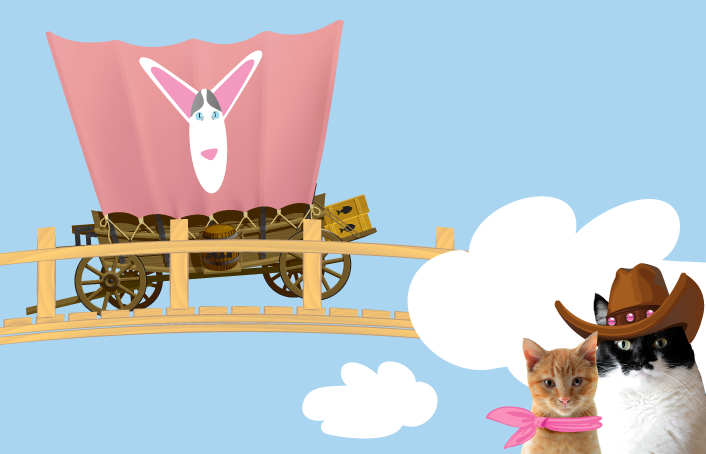 We're switching over to Mail Chimp and we're going to tell you all about it TOMORROW. It's pretty cool! In case you haven't heard, Google Reader is going away July 1. So if that's how you like to read our blog and others, you might want to consider subscribing by entering your email address in the new form at the top of our sidebar. If you were already subscribed through Google's Feedburner, we've transferred your email addresses over to our new system. But if you haven't heard from us in the past couple of days, you should probably check your spam filter. And if we're still MIA, please sign up again in the new box. Thank you! Feedburner is not going away...so don't panic. 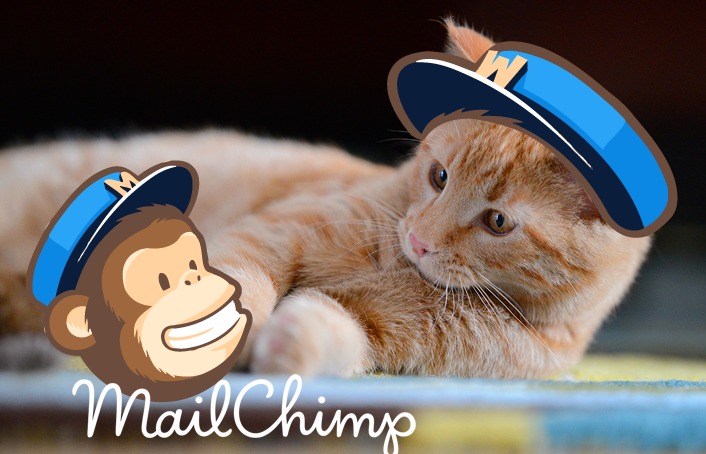 We just decided to make the switch because we like the features of Mail Chimp so much more. And it's cute. Today the Cat Blogosphere is membering a very special and famous cat named Skeezix. The Boss tole me he was a blogging pioneer. I never got a chance to ride in his pioneer wagon or stare up at the stars with him. 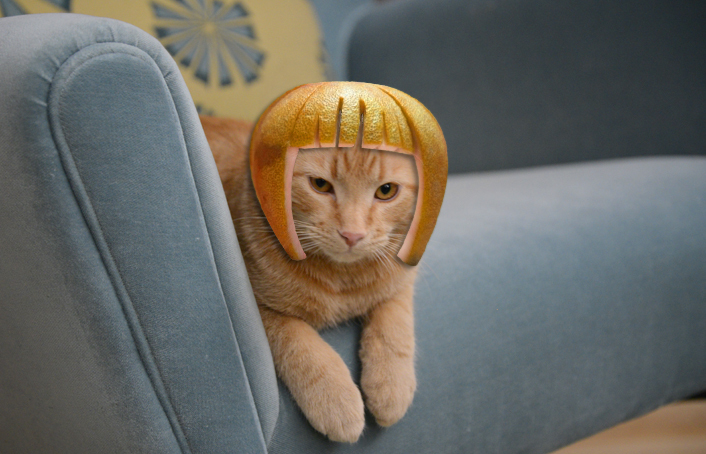 But legend tells that he was one COOL cat. He was famous for his sunglasses, his mad moving making skills and his command of the English language. The Boss is cool and all...I mean I have to live her with her. 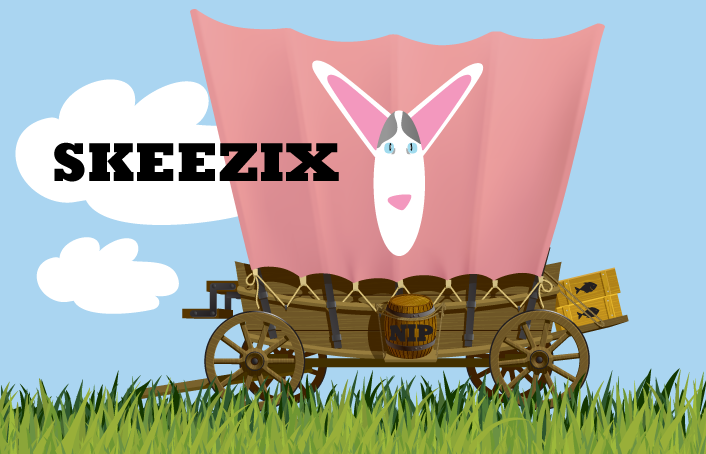 But Skeezix is someone I can reely look up to. Goodbye Skeezix. Say hi to all the kitties that came before us. I hope you brought enough nip & fish for everybuddy. 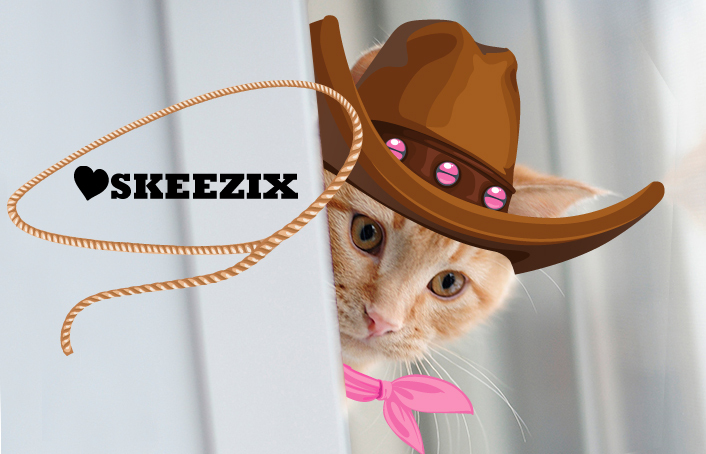 Happy Trails, Skeezix. We'll miss you. A Friends of Skeezix Memorial Drive has been set up to honor our furiend's memory. Donations are open now through June 30.